Permesuari, Indhira (2005) Gambaran Persepsi Dan Kepuasan Pasien Terhadap Kualitas Layanan Rumah Sakit. Skripsi thesis, Universitas Tarumanagara. Patient’s perception towards services provided by hospital is a process of interpretation that is done by a patient to the performance of a products or services in the hospital. A patient satisfaction is a respond or emotional feedback that is created based on his/her experienced after consuming a particular services. 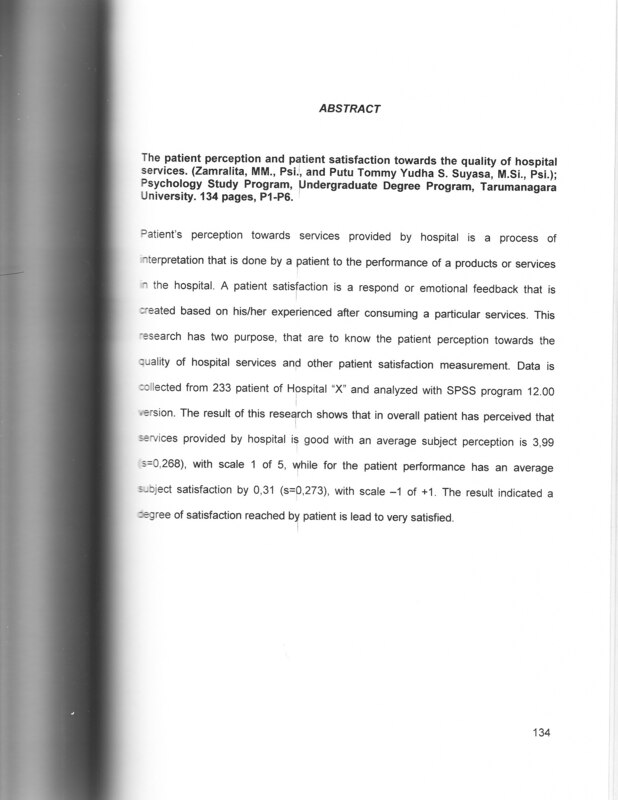 This research has two purpose, that are to know the patient perception towards the quality of hospital services and other patient satisfaction measurement. Data is collected from 233 patient of Hospital "X" and analyzed with SPSS program 12.00 version. The result of this research shows that in overall patient has perceived that services provided by hospital is good with an average subject perception is 3,99 s=0,268), with scale 1 of 5, while or the patient performance has an average subject satisfaction by 0,31 (s=p,273), with scale -1 of +1. The result indicated a degree of satisfaction reached by patient is lead to very satisfied.